GridStat is a middleware framework architecture tailored for power system data delivery. Power system applications set specialized requirements in terms of delay, rate, availability, etc., and this project answered GridStat’s need to be tested and validated to meet specific application requirements. 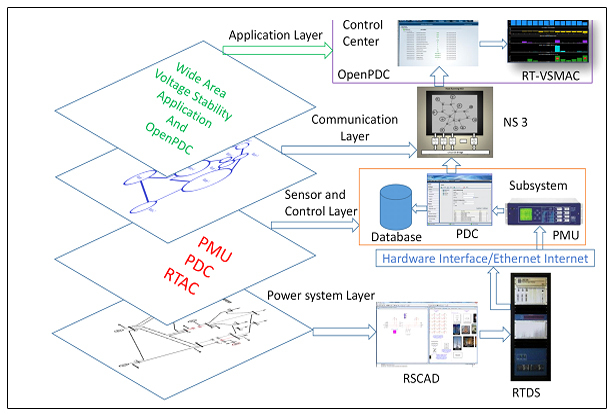 It also investigated communication requirements for conventional SCADA and PMU-based wide-area network systems. We developed a real-time testbed integrating a power grid, sensors, communication, and applications to create real-life scenarios to validate the GridStat middleware communication and other communication architecture, and we utilized the developed test cases to perform cyber-physical vulnerability analysis. The testbed uses a real-time digital simulator (RTDS) to interface with physical sensors, real time controllers, communication emulator NS-3, DeterLab, GridStat, data archival and a real-time voltage stability application. With the communication features supported by DeterLab, we are able to observe and interact with communication routers, switches, malicious software, operating in realistic network environments at scales found in the real world. Part of our effort was to conduct cyber-physical vulnerability analysis with incomplete data availability. Specifically, graph theory-based vulnerability indices for the power grid were used to rank possible set of multiple contingencies with limited information; the developed vulnerability analysis indices were integrated with cyber vulnerability indices for integrated cyber-physical vulnerability analysis. Cyber vulnerability analysis and attack models for man-in-the-middle attacks, denial of service attacks, and communication line outages were analyzed using the developed testbed. Finally, we developed a cyber-physical training simulator using the cyber-physical vulnerability index and integrated cyber-physical simulation. Real Time Cyber Power System Analysis: Anurag Srivastava, Washington State University, presents closed loop cyber-physical modeling in an end-to-end simulation from generation through application analysis. Presented at the TCIPG Industry Workshop in November 2013. GridStat in use with GridSim: Presented by Anjan Bose, Washington State University, at the TCIPG Industry Workshop in November 2011.